I call Paul 'The Oracle', he has an incredible capacity to see things through the eyes of others... together Paul and I are like 'The Sorcerer and the Apprentice'. The Gelder Group is a modern, forward thinking construction company, employing over 300 people nationwide. 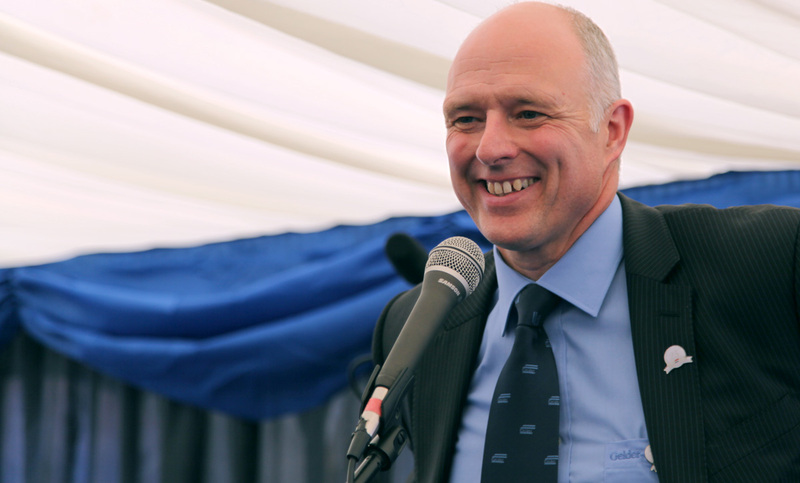 MD, Steve Gelder, formed the company in 1988, having started his career as an apprentice. The Group now consists of 8 operational divisions and 6 associated companies with a turnover in excess of £40 million. The absolute unique appeal of human alchemy is that Dawn and Paul are exceptional trainers that can bring to bear their vast experiences of working at the highest levels in business. I have always tried to set goals and visions and in 2006, I wrote a plan to take the Group from £16 million to £40 million by 2012. I printed this in a booklet and presented it to the 16 people in the business I recognised could take the business forward. We celebrated our 25th anniversary last year and decided it was time to look forward and Paul and Dawn made it clear that the best results will be achieved if we get my managers to invent and take ownership of their plans and engage their people to deliver them. Dawn and Paul are brilliant trainers, coaches and facilitators and have worked with my senior team to help them create their individual company visions and together, develop 20 goals for 2017. This has required a massive amount of soul searching and team working, but unless you have a stretching vision of the future, you are just driving around aimlessly. My journey with Dawn and Paul is so much fun, I never stop laughing, they are both great to work with but never let us off the hook. Thanks to them, my communication skill has vastly improved and I am now crystal clear in my appraisal of others, much more aware of what they might be thinking and how I am perceived by them. Until I met Paul I never really understood the impact I have on those around me, whether it is walking through reception and asking someone to smarten up and straighten their tie, to the respect I have now earned amongst CEOs of successful multi-nationals. I face many new challenges and situations. I address rooms full of people and rub shoulders with Royalty and in Westminster. To be honest I am often nervous and feel a bit of a fraud at times. Paul as a mentor has taught me that these feelings are completely normal and I should embrace them. Paul has been in exactly the same position, relates to how I feel and tells me it is normal, and not to fear it. Having started out as a builder’s apprentice, I associate more with a bricklayer or site foreman, but now realise they may feel intimidated by me. Equally, I don’t feel I naturally belong in private clubs with CEOs but my training has helped me recognise I have a talent for making connections at all levels and have to earn their respect. It is engaging and inspiring to know Paul achieved so much in business and like me, started out as an apprentice, facing similar challenges along the way. Paul and Dawn have helped me to see this is OUR TIME, we are now on the front foot and loving it. Together they have instilled the belief we can actually achieve these stretching visions. It has been very intense, the senior team have had to be very honest with each other but without doubt, Dawn and Paul’s skill and commitment has transformed our leadership. I don’t want to get to 75 and know I had a shot and really bottled it. Even if I fail, I know I will have tried my hardest and Dawn and Paul have lived it with me and the team. There is an emotional attachment between us now, which will live to 2017 and beyond. This relationship goes far deeper that just another training session.